Patriotic Quilt - an "almost Quilt of Valor"
My sis found these blocks in with some of the fabric that we bought from the lady who sold us her mom's stash. They were already put together and were far too nice to just let them sit there. These were blocks that are often called "stack 'n whack". I think the method is super cool, but I admit that I am not totally in love with most of the finished quilts since they just seem like madness to me (running - ducking for cover)! Don't be mad at me - this is just my personal taste. Often I can barely see each block because they are usually pushed right up next to each other - and the thing is, the blocks are incredibly cool! Individually they are works of art and I really like being able to look at and enjoy each one's beauty by itself. However, THESE blocks to me are perfect as each block is on display - so we can appreciate the beauty of the individual block! Rachael knew that we had coordinating fabric when she uncovered the blocks, and she put it aside. She knew I would want something to help coordinate the blocks to make a complete quilt out of them. And so, I did. I simply put a navy sashing between the blocks, but I wanted some more color in the border, so I did what you see by using up the rest of the coordinating fabric that I had. My next problem - "What do I do with it?" I live in Poland - and I didn't want to give it or even offer it to a Polish person. 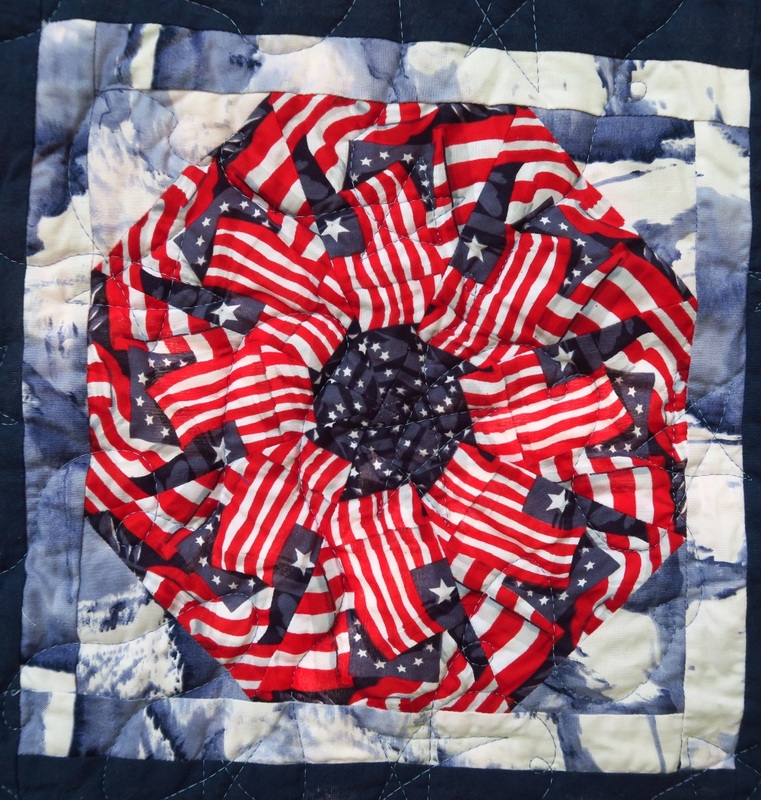 Americans are already accused of touting themselves as being a super country - and I didn't want that - even though I'd probably have several people want such a quilt. I quilted it with stars and loops. I FINALLY feel pretty confident with loops, loops and hearts and now loops and stars. I thought a bit more about who would get this quilt after I finished the top. 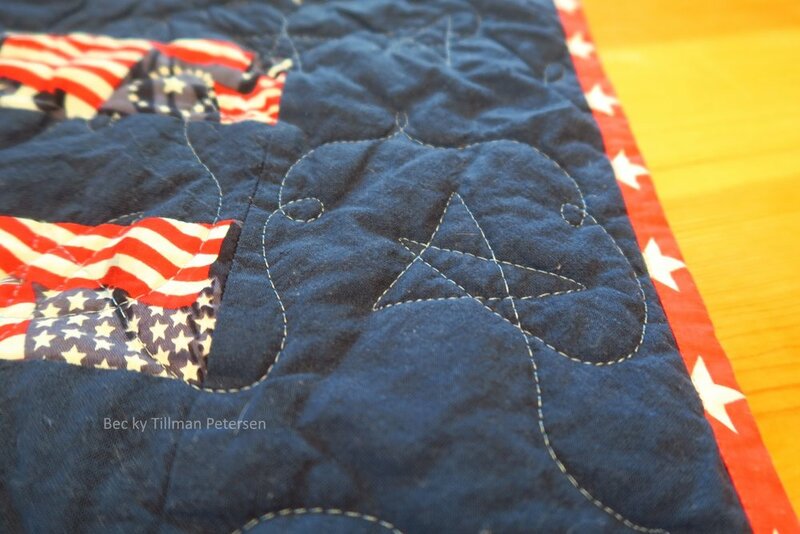 I wanted it to be an American - and preferably on THIS side of the ocean - since that is where the quilt is. My friend, Jolie, (another Baptist missionary here in Poland) has a husband who served in the military! I checked with her and asked her if she cared if I gave it to her husband, Paul. She said, "Sure, you can give it to him!" So I have my recipient! That makes me happy! I am not sharing a pattern for this - I didn't make the blocks, and making the sashing and outer border effect was very specific to this quilt. I used up all my extra flag fabric I had and added navy blue, red and red star fabric to finish this one up. Overall, I'm pleased. I feel like I accomplished a "save" in baseball terms. These blocks were just languishing. Now they are a quilt. Soon they will go to a new home! And that's what's new from my part of the world with regards to quilting, anyway! Be sure to check out what my sis has for you in the store! Surely she's got something you can use!